Editor’s note: This post synthesizes a recent Teachers College Record article detailing a framework for initiating NICs, written by Jennifer Lin Russell of University of Pittsburgh’s School of Education; Jonathan Dolle of WestEd; Louis M. Gomez of UCLA’s Graduate School of Education and Information Studies; and Anthony S. Bryk, Paul G. LeMahieu, and Alicia Grunow of the Carnegie Foundation. 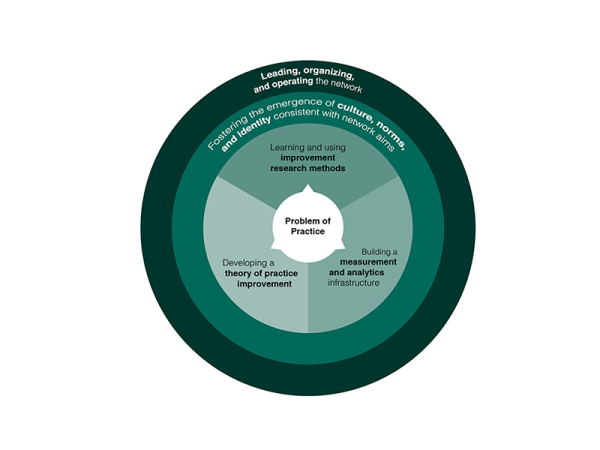 The Networked Improvement Community (NIC) model is a promising way to address complex educational problems. NICs bring diverse expertise to bear on specific problems of practice, and what’s learned in one part of the network can be quickly spread to and tested in other contexts. But building a strong and enduring improvement community requires an organizing entity — known as the network initiation team — to carry out specific strategic actions. Over the years, the Carnegie Foundation has been investigating and analyzing the features that give rise to successful NICs. The authors of “A Framework for the Initiation of Networked Improvement Communities,” written for Teachers College Record, synthesized those features into five domains, areas of activity that productive NICs have in common. The framework is based on both theory and practice. Each of the five domains requires a specific activity that, when taken together, creates what the authors describe as “the strategic actions of a network initiation team.” In the following table, the domain is summarized in the left-hand column and its corresponding action, along with examples, is described in the right-hand column. A network initiation team is a core group made up of educators, researchers, and designers, each with their own areas of expertise. One of the network initiation team’s most important tasks is to develop a theory of practice improvement. This means that team members must thoroughly investigate the problem they are aiming to solve (the problem of practice at the center of the framework above, the focal point of all the work of a NIC). They do this by combining the latest academic research with analyses of the local context and system that produce problematic outcomes. Based on their research, the team creates a provisional driver diagram (that will evolve as the network’s understanding of the problem deepens), mapping out the major contributors to the problem as well as change ideas for improvement. The heart of the driver diagram is the aim statement: the specific, measureable outcome the network is designed to achieve. The network initiation team for the Carnegie Math Pathways NIC — a network dedicated to improving student success rates in developmental math courses — was comprised of community college faculty and administrators, experts in mathematics and instruction, and others. During their exploration of the problem of low rates of student success in remedial math, the team combined research-based knowledge, feedback from extensive conversations with key stakeholders, and their own on-the-ground investigations of the experiences of actual community college students. Over time, they developed a theory of improvement that included high-leverage drivers such as addressing language and literacy barriers and embedding supports for core math skill development within the curriculum. The team also articulated the network’s aim in specific terms: to increase the proportion of students achieving college math credit in one year of continuous enrollment from 5% to 50%. Next, the network initiation team must turn theory into action by learning and using improvement research methods. Network members, including the initiation team, should be well-versed and practiced in the methods used to test, analyze, and refine changes (which may be new tools, work processes, roles, norms, etc.). The initiation team should develop a plan for how it and network members will learn these methods; some options include targeted trainings (through simulations, regular network meetings, summer institutes), ongoing coaching (by improvement advisors or improvement facilitators), and routines to scaffold member participation. The Building a Teaching Effectiveness Network (BTEN) brought together leaders in education practice, policy, and research to improve the development and retention of effective teachers. To strengthen their improvement research expertise, BTEN’s initiation team brought in improvement advisors from a variety of sectors and also engaged in intensive training with the Institute for Healthcare Improvement. The initiation team built capacity within the network as a whole by conducting summer improvement science institutes for members and providing ongoing coaching support for district-level improvement facilitators. Testing change ideas requires a system for measuring what effects they have on practice. In order to build a measurement and analytics infrastructure, the network initiation team needs to bring in practitioners with contextual knowledge of the system, people with research expertise about the problem to be solved, and analytics staff. This expanded group decides on measurable targets for improvement, establishes data collection routines, and identifies indicators that will help the network monitor progress over time. Importantly, this analytics system turns data and analysis around quickly (and is not focused on using data for accountability purposes) so that the network can learn and improve. Over time, the Building a Teaching Effectiveness Network came to focus on improving feedback and support processes for new teachers. The initiation team identified measurable “big picture” targets — including goals for teacher attrition rates and performance ratings — for which they negotiated with participating districts to create routines for periodic data collection. The team developed a survey to assess teachers’ self-efficacy and burnout, two factors that are linked to attrition rates. Additionally, the initiation team developed a set of process measures to ensure feedback protocols for administrators and teachers worked as intended and to troubleshoot issues as they arose. The network initiation team is responsible not only for the above foundational tasks of the network’s launch, but also for creating the conditions to maintain its success and sustainability, which include initial leadership, organization, and operation activities. Leadership in a networked improvement community is not the traditional hierarchical command and control structure; instead, the initiation team must foster a shared commitment to a common vision in order to motivate members to actively participate. The team can recruit and engage members by including well-respected experts and practitioners, providing evidence of early success, and making a compelling argument for the importance of the network and network membership. Though communication and knowledge-sharing routines will be refined over time, the initiation team gets the ball rolling on the initial development. The Success for All Foundation (SFAF) — a nonprofit that leverages its network of thousands of schools to ensure that students master grade-level literacy skills — was able to recruit its initial partner schools based on the excellent reputation of its founders and its affiliation with Johns Hopkins University. Later, SFAF was able to recruit additional school sites on the strength of its previous successes among the first group of participants. The initiation team developed an organizational structure linking schools to a coordinating hub, and knowledge was shared through the close working relationships between SFAF’s hub management team, developers, and trainers in schools. The knowledge management system evolved over time to include more formal systems for monitoring sites and reporting information. Working in a NIC — which emphasizes collaboration, transparency, and the use and sharing of data for learning and improvement — can be a very different experience for new members. Therefore, the network initiation team is responsible for developing strong network culture, norms, and identity. The team establishes norms of participation, processes to convey them, and a compelling narrative for why the mission of the network and membership in the network are vital and valuable. Network activities and meetings can create a sense of belonging and shape professional identities in a way that aligns with the network’s narrative of improvement. A common mission and shared beliefs about how to achieve that goal are critical aspects of any successful network. The National Writing Project, though not a NIC per se, is a long-running national network that works to improve the teaching and learning of writing. From the beginning, its members have shared a common purpose and passion, and over the years, the network has deliberately created a culture that supports its goals. The NWP narrative — the argument for the value of the network — is based on members’ shared belief that writing is important, their common identity as writers, and on their collective commitment to continuous improvement and to advancing the profession. The NWP also hosts an annual summer institute where new teachers are initiated into the network and introduced to network norms and practices. To learn more about the NIC initiation framework, read the full Teachers College Record article and our previous blog post series, which includes other examples of NIC initiation from the Association of Public and Land-Grant Universities and the National Board for Professional Teaching Standards.